236 pages | 7 Color Illus. | 52 B/W Illus. Sparse models are particularly useful in scientific applications, such as biomarker discovery in genetic or neuroimaging data, where the interpretability of a predictive model is essential. Sparsity can also dramatically improve the cost efficiency of signal processing. Sparse Modeling: Theory, Algorithms, and Applications provides an introduction to the growing field of sparse modeling, including application examples, problem formulations that yield sparse solutions, algorithms for finding such solutions, and recent theoretical results on sparse recovery. The book gets you up to speed on the latest sparsity-related developments and will motivate you to continue learning about the field. The authors first present motivating examples and a high-level survey of key recent developments in sparse modeling. The book then describes optimization problems involving commonly used sparsity-enforcing tools, presents essential theoretical results, and discusses several state-of-the-art algorithms for finding sparse solutions. The authors go on to address a variety of sparse recovery problems that extend the basic formulation to more sophisticated forms of structured sparsity and to different loss functions. They also examine a particular class of sparse graphical models and cover dictionary learning and sparse matrix factorizations. "… an excellent introductory book for branching off into aspects of sparse modeling; it is also good for advanced students since it is contains an appendix with some of the mathematical background needed to learn from this book, including topics such as eigentheory, discrete Fourier transform, and subgaussian random variables. I very much recommend this book for researchers and students alike." 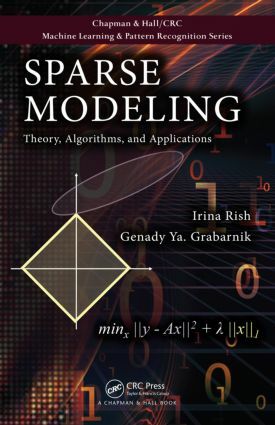 "A comprehensive, clear, and well-articulated book on sparse modeling. This book will stand as a prime reference to the research community for many years to come." "This book provides a modern introduction to sparse methods for machine learning and signal processing, with a comprehensive treatment of both theory and algorithms. Sparse Modeling is an ideal book for a first-year graduate course." A Summary and Bibliographical Notes appear at the end of each chapter.